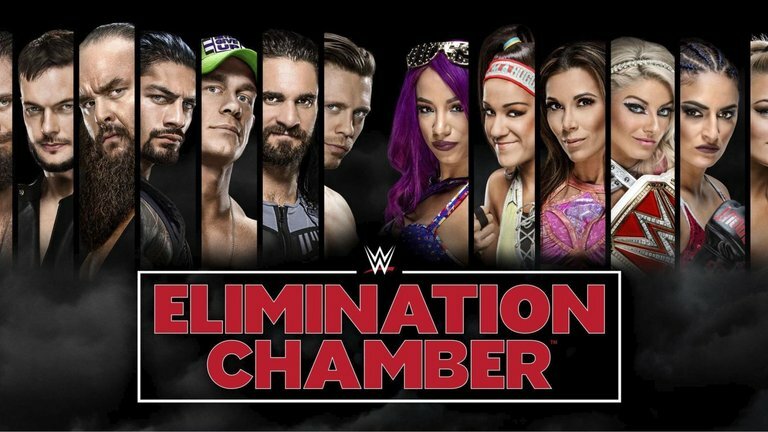 WWE Elimination Chamber 2018 preview/predictions – AiPT! What will the Raw landscape look like going into WrestleMania? Elimination Chamber, the seminal speed bump on the road to WrestleMania, is upon us this Sunday in the form of a Raw-exclusive pay-per-view event. Though technically a lot is on the line — WrestleMania main event spots, championships, contracts — a lot of this show feels telegraphed from a mile away. Backed by statistician Dana Brooke, who comes up with such illustrious stats as “when Titus gets more strikes in he is more likely to win,” Titus Worldwide has been on a mini-tear of late, netting surprise wins against Tag Team Champions Cesaro and Sheamus on multiple occasions. Will The Bar be able to dispense their brutal brand of justice, or is it true what they say: Crews can’t lose err…can’t follow Apollo? Patrick: A week after coining the actually-not-bad catchphrase “Crews can’t lose,” they go ahead and chop “Crews” off the poor guy’s name. It didn’t help that immediately after pushing that phrase Crews did, in fact, lose, but still. Titus Worldwide actually has grown into a fine little stable, and while it wouldn’t completely shock me to see them eke out a win for the titles, especially given rumors of nagging injury for Sheamus, they are just not on the same level as The Bar. The Bar retains. Brian: Are we waiting for another tag team to debut or something? Who are the other tag teams on Raw? Balor Club, Miztourage, Hardyz (IR), The Shield (IR), and The Revival? Man, Titus Worldwide is a decent placeholder, but there’s no way this is a feud that runs into Mania unless it’s on the pre-show. I don’t feel good saying that, but while I enjoy Apollo (neé Crews), I’m not into Titus or Dana yet. I really hope they prove me wrong. Otherwise, I expect to see The Authors of Pain arrive after Mania to assert dominance. Losers: Those of hoping that the tag team division lives up to its potential. Jason: Let’s be real. Titus Worldwiiiiide is a J.O.B. Squad. They’re only here because there isn’t another face tag team on the Raw brand and we haven’t built up the Club enough to be tweeners with a championship belt. That being said, the only thing that makes sense to me is putting the belt on the Revival, which should be earned off a team of good guys. I think Apollo and Titus may just pick up the belts here to lose them on the WrestleMania pre-show. WWE’s resident freaks have been seemingly engaging in a laugh-off for the past couple of months, trading wins with one another as often as they trade incomprehensible promos. Will the Woken Warriors finally get something to cheer about, or will the Eater of Worlds finally land a big win? Patrick: Didn’t this feud end at Raw 25? Or was that show somehow even less consequential than I originally thought? If there’s any hope of making Woken Matt Hardy relevant, he simply cannot lose to company punching bag Bray Wyatt. The deranged backwoods cultist-turned midlife crisis KoRn fan playing the straight man in a feud has been entertaining to a point, though. I want, and expect, Matt Hardy to win. Jason: Man, do I not care about this feud. I’m going to call it for Bray unless they decide to finally take this match to its logical conclusion by having the two fight in front of a green screen or at the Hardy Compound. He’s younger and there’s likely more money in keeping him with whatever level of viability he currently finds himself in than betting on selling Broken Matt shirts for the next two years that his hips will allow him to continue to lose these matches. Losers: People who had any misconception that Broken Matt would be a champion in WWE. The irresistible force vs. the unbeatable submission machine. The winner of the first-ever women’s Royal Rumble match, Asuka, has been tasked with taking down the girl who’s not like most, Nia Jax. Should Nia bring Asuka’s record-setting streak to an end, she’ll be added to the Raw Women’s Championship match at WrestleMania, but in a lot of ways, ending the vaunted streak would be its own reward. Patrick: Asuka has been undefeated (asterisk, caveat, etc etc) for over two years now, but Nia has seemed to get a little bit of a renewed push as of late, and I’d be shocked to see either women’s title match at WrestleMania be straight up one on one matches. Nia ends the streak, possibly through shenanigans, and gets added to the match at Mania. Brian: Why, why, why would you have Asuka lose pre-Mania? Why? If anything, I see a no contest (which will get Nia added to the Mania match) or some DQ shenanigans that keep the “undefeated” streak in place through Mania. Loser: WWE’s Women’s Division if Asuka somehow loses. The women’s evolution continues just a month after the ladies made history with the first-ever women’s Royal Rumble match. This time six of Raw‘s brightest female talents step into the satanic structure known as the Elimination Chamber, where Alexa Bliss, much to her chagrin, has been ordered to defend her Raw Women’s Championship. Patrick: I’m looking forward to this one. I’m a fan of just about everyone in this match (I mean, I was a Mickie James fan, like 12 years ago if that counts? ), and always happy to see female firsts in WWE. If Nia Jax does indeed get added to the Mania match, it stands to reason that Bliss will retain. And since Sonya and Mandy are way too green to carry a title into Mania, Bayley’s career is on life support and Mickie is closer to actually being on life support than anyone else in the match, that only leaves Sasha Banks as a credible contender. It’s possible The Boss pulls this one out, but thinking in terms of firsts, she was already the first-ever #1 entrant into the women’s Royal Rumble, and currently holds the record of Rumble ironwoman, so let’s give Bliss the accolade of first-ever women’s Elimination Chamber winner. Brian: I don’t see anyone but Alexa coming out with the belt, but I expect some shenanigans to occur to maybe add one or two more women to the title match at Mania. Why not? There are strong wrestlers in this match, but few strong enough characters to be currently credible title holders. To paraphrase Papa H, the title doesn’t make the woman, the woman makes the title. Since Asuka is coming at Mania and Ronda Rousey is signing for Raw, several of them are about to be lost in the shuffle. Jason: This has some potential, but much like the men’s Chamber, I feel like we’ve telegraphed the winner. Honestly, there are no money matches for the Raw Brand if Asuka fights Charlotte at the show of shows (which she will), but the closest thing they have is Nia vs. Bliss. As such, Bliss is walking out of this match the champion. I’m going to bet she and Mickie James make it all the way to the end, until Bliss flips on Mickie and scores the pin for the win. Loser: Absolution. Both women are going to go out with little fanfare, so any hope that they’ll be players in a post-Rousey world is little more than a pipe dream. Of course, this isn’t a match, but since it’s been announced it’s been one of the selling points of the PPV event. Ronda Rousey made a surprise appearance at the Royal Rumble last month, where she…shook some hands and pointed a lot. Will her WrestleMania plans become clearer come Sunday? Patrick: Ronda Rousey is easily the most high-profile female star WWE has ever signed, and is up there for biggest star period. That’s why it’s a safe bet Stephanie McMahon will involve herself in this segment somehow. Rumor is some kind of tag team match between Rowdy Ronda and either The Rock or Kurt Angle vs. Stephanie and her husband, Triple H. I expect the beef between Ronda and Steph to begin here. Side note: This has to be the first PPV where half the announced segments involve women, right? Kudos to WWE — for all the mishandling of the branding of it, the women’s evolution is real and it is awesome. Jason: If this sequence doesn’t end with Ronda Judo flipping Stephanie McMahon I’ll eat my hand…ful of Cheetos. Look, I expect this to set up Ronda’s match at WrestleMania, but I don’t think even WWE knows what they’re doing with Rousey at this point. I don’t think they’re ready to throw Ronda in there with a real performer, so I imagine she’ll somehow set up the rumored mixed-gender match at Mania with Steph and Trips Vs. Ronda and…probably, Kurt Angle. Brian: This is going to be a very, very thin line for WWE to walk. Ronda has the reputation she needs coming in, but she lacks the…gravitas that someone like Brock Lesnar brings to the table. She doesn’t have the build of an instant game changer, so she has to make up for that with her in-ring skills and promo skills. S--t. I’m really concerned. I think the only viable program here is something with someone who has experience delivering a solid character and taking a believable beatdown. Enter Stephanie McMahon. God help us all. Patrick: I mean…Reigns, right? It has to be Reigns? Every year it seems that the rumored WrestleMania main event is Brock Lesnar vs. Roman Reigns for one of the top titles, and this year is no exception. It’s also the year that it seems to be actually set in stone: there are no Money in the Bank holders waiting in the wings, no Daniel Bryan-esque surprise megastars to derail the plans. You’re getting The Beast vs. The Big Dog this year, and you’re gonna like it, dammit! Jason: Dude, why are we pretending like it won’t be Reigns? I don’t imagine that Braun’s crazy popularity is enough to have WWE divert their Mania plans, so it’s gotta be Roman. Think of the dudes in this match, and the only ones who could stack up to Brock are Roman or Braun — and my man Strow is probably going out early after eating like four finishers in a row. Roman will go on to beat Brock at Mania, it’ll be mildly disappointing and we’ll all move on. If I had to predict elimination order, I’d say Miz, Rollins, Strowman, Elias, Strowman, Cena and Balor. Loser: Finn. Even though I listed him as runner up, dude’s probably going out first. Poor Fergal. Brian: The only non-Reigns scenario I see here is some type of Reigns-Rollins situation. And that’s unfortunate. Not because I’m some smarky Reigns-hater — far from it. I just hate predictability. Out of the seven guys in this match, only three have a realistic story going into Mania against Brock: Reigns, Rollins, and Strowman. Finn has the “I never got my rematch” story, but there’s no way they feed him to Brock. There’s too much upside in the long run that will end when matched up against someone who weighs 200 pounds more than him. He’s already got a mini-feud started with Miz, so that’s our Mania IC start-up. Balor Club v Miztourage. Cool. Elias is the annual “guy with no shot” who needs some testing (see Baron Corbin circa 2017). Strowman will do some awesome stuff, break some things, etc, but he’s not main spot Mania ready quite yet. Cena has been building up a great “I’ve got no spot at Mania” story that should culminate in either a match against Taker (shudder) or maybe something putting over a younger talent like…I have no idea. So, that leaves Reigns and Rollins. I’d love to see a rematch of Wrestlemania 31 with Brock-Reigns-Rollins. Book it! Loser: Anyone who doesn’t make Reigns look strong.